Air Asia: Now Everybody Can WAIT! I have been meaning to write about this for the longest time but I would have to admit that my schedule for the ENTIRE month in June truly took a huge toll on me. Nevertheless, it did inspire me to write about this post which in a way is a win win situation. 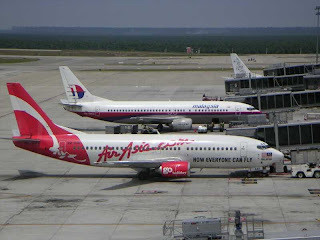 I believe that a lot of us actually know about Air Asia, one of the leading low cost carriers in the region and I would also like to believe that most of us would rely on the services of Air Asia as a preferred choice of travel especially for short distance holidays around our region. In a way, a lot of us do rely on their business for us to travel. 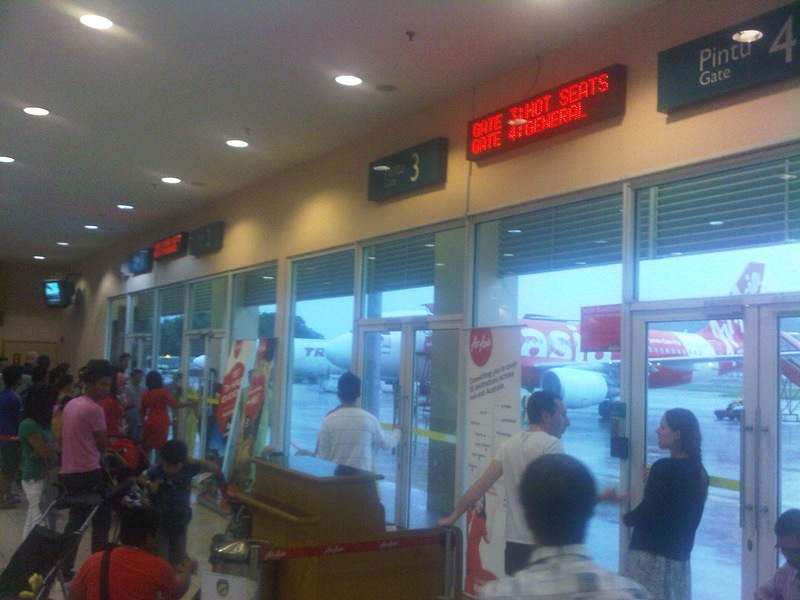 Question here is Air Asia really living to their standards as the "best low cost carrier" in town? I was coming back to KL from Kota Kinabalu from a day business trip and was taking the night flight back to KL via Air Asia. 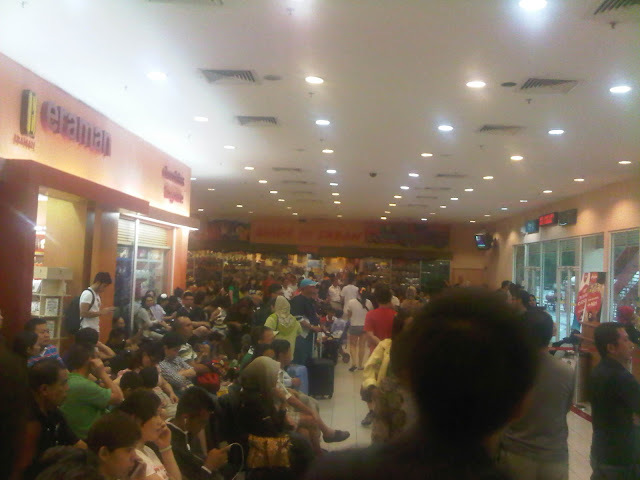 Upon my arrival, I was shocked to see that the entire waiting area was completely packed with people. So we waited and while doing so, I took some time to chat around the people waiting there. I was shocked that some of them have been in the terminal for the last 3 hours, just sitting around waiting for someone to tell them what is going on. None of the staff even bothered to make any announcements, nor was there any indication of whether their planes were even coming or not. After a few hours (yup, you saw that correctly) of waiting, passengers then started to shuffle around anyone that was working in the airport to get any information of what was going on. Some had connecting flights at their destinations and some had people waiting for them back at the other end of their destination. After much questions from the people, one staff took the mic and told everyone that all the 5 flights (including mine) was cancelled. We were told that we were required to recheck in again outside of the waiting area which resulted in a scramble of people outside Terminal 2 because no one told anybody where to do this and we were practically guessing which was the right queue that we need to be in to re-register ourselves for the next flight. Personally I had to queue in 3 different lines before I found out that I was in the wrong queue after every time that I waited in them. After half an hour of scrambling, I finally found the right queue together with a few people I managed to rope in with me. 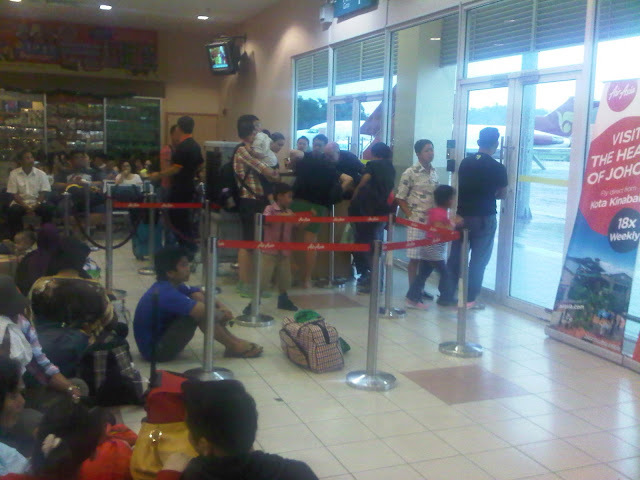 In the queue, I found out that some people had to even stay in Kota Kinabalu for the night because they could not accommodate anymore people in the flight. I was one of the lucky ones that managed to get a seat and proceeded to wait in the waiting area AGAIN. You would think that the nonsense would stop there right? "You punye flight dah boleh masuk dah..." as she answered simply. That really got me annoyed that they did not even bother making an announcement that people are allowed to board the flight and majority of us were still waiting, thinking that its not time to board yet. On the flight, my company paid for per-ordered meals during the flight but because no one mentioned to the crew that they were going to be more passengers in the flight, I was given nothing to eat. This was one of the many incidents that I have faced with this airlines and despite the number of complaints made, no notifications as to any actions were taken from their management to rectify this situation for most of us. MY CLASSMATE Asahara was stuck in the same situation in Kuching after a business trip, with no one telling him his situation for the last 4 hours. When he got into a flight home, he reached KL at 2.30am which he had to pay DOUBLE for his taxi back home because of midnight charges. A COLLEAGUE of mine was told that he was NOT ALLOWED to board his flight to Philippines because his name was not in the register, while the rest of us who was about to board could hear the PA system calling for his name. When the front counter realized their mistake and let him in, they have already closed the boarding gate. When he asked for a refund for his ticket (amounting to RM600), he was just told he can't, with no reason given whatsoever. A FAMILY MEMBER had the same situation happened to her as well in her flight to Singapore which was cancelled, due to unforeseen circumstances but was not informed to her until the 11th hour. She had to wait in the terminal for a good 3 hours before someone told her what she needed to do. Amazingly enough, all these incidents happened in the span of one month after my incident. I am personally astounded that Air Asia would allow incidents like this to happen and I am equally appalled with how complaints and customer requests were ignored in light of their services. I would understand that operations may have it faults but I do not understand how a company like Air Asia would practice such business practices and still feel that they are the "best" when it comes to low cost carriers. Would this still be the case? With ticket prices these days, I don't see that much difference in the prices between Air Asia and normal flight carriers like MAS, which provides A HUGE DIFFERENCE when it comes to their customer services. Plus with new services like Malindo Air and Firefly made available to increasing destinations around town, why should we patron our business with Air Asia anymore if they are going to continue their business practice as such? In my opinion, Air Asia needs to have a serious wake up call in their organization, otherwise risk losing more and more business to their other competitors. I believe that customers are getting fed up being ignored when it comes to the complaints and expectations that they have with the business of Air Asia, which at this moment they have been doing to many of their customers. My company takes Air Asia as their preferred low cost carrier for staff domestic travel. I would now want to suggest to my own management to change this policy, unless improvements is made to rectify this problem from the Air Asia management.